Art = Life at R.L. Delight Fine Art: You Spent the Day Doing What? I didn't paint today. All those chores and errands I have been putting off all month hoping they would just wait until the end of the challenge period decided that today was the day to be done. Well, at least some of them did. I discovered a glitch in the library e-mail notification system. The system neglected to tell me my books were due, and then overdue. I realize now how much I depend on the system. I also know that ultimately, it is my responsibility and I do take my library privileges and responsibilities seriously. So, today after sending a painting off to the United Kingdom (hooray! ), I went to the library to deposit said books and pay up. I spent way too much time trying to round up the mailing supplies to ship that painting. Apparently, we ran out of supplies all at once and the one tiny store here that possibly had the supplies had a sign hanging on the door, "Back at 4!" Little by little the day and delayed chores and errands unwound. In spite of constantly eying the weather and desperately wanting to get out to paint, I felt pretty good. I know that I can get another extra painting in. Not only that, I suddenly realized that I have accomplished what I wanted to achieve with this challenge! I could stop right now and be satisfied. I did actually consider it but decided I will continue along.as best I can until the end. It isn't long now. The fact is I am champing at the bit to move on. I know now that daily painting won't really work with my life and with what I want to do. I know that I can push myself to be more prolific than I was before I started. I will be working everyday but not always completing a painting every day. This will allow me to have the balance I need and be able to achieve my vision. So, what is it I want to do? I want to paint larger paintings for one. 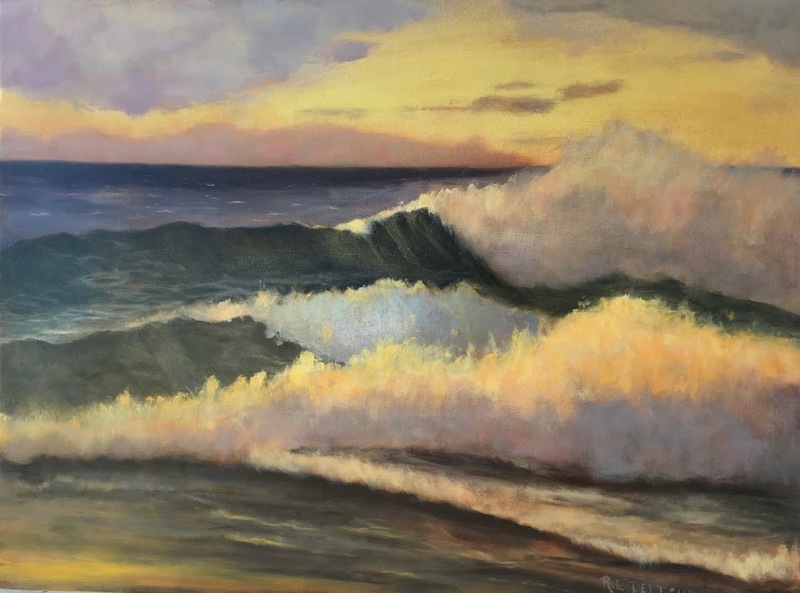 I want to continue to get out and paint waves and the surrounding landscape, I want my paintings to not only directly help the causes I am passionate about, but also to inspire others to care and educate them, and me, about our oceans. I want to have time to study the waves, the sea life, color, painting and drawing, and the ocean in general, in depth. I want to reach out to those who have been at this much longer than I have and ask a lot of questions, about everything. I want to share it all too! Thanks to this challenge, and the online classes, books, DVDs, Blog and Facebook friends I have a good idea of where to go and what I need to do. Which is why I felt good today, even though I wasn't able to get out and paint. I know what I need to do to organize my life so I choose when or when not to paint (well, most of the time, the Fates can intervene when least expected). So today I only have a picture of my handsome crow friend to share. 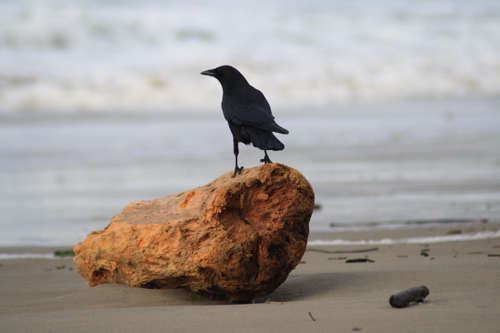 The crows and gulls keep me company on the beach when no one else is around. I am rather fond of them. They get quite bold at times. The weather is changing but I should be just fine. I found my rain pants the other day! I have added a few extra braces and supporting infrastructure so hopefully the chores and errands will stay put for now. Wait, do you hear that creaking noise? I enjoyed reading your post today, RL. You've expressed some things that a lot of us doing the 30 in 30 must be feeling. I know what you mean about daily painting. It definitely takes its toll after awhile... and ts okay to realize that its just too much. I love your crow photo! A handsome crow, definitely. I'm glad you are feeling happy about your progress and direction.... I certainly think you should! Your photo of your collected wave paintings is fascinating. Waiting for more! Thanks for the comment Linda. Actually, to clarify, I don't feel that it is too much, just not how I want to work! The work I want to do does not fit into the daily painting framework. A very good thing to discover about myself and my work. I am happy about that and it has been time well spent! I love what you have been painting for the challenge. Very beautiful. Hi Dana! More coming up soon! Are you still doing graphic design? I would love to have a logo done sometime down the line and have always admired the one you made for your business. When I am ready I am hoping to commission one. Thanks for stopping by!